Do you know what is the most common food allergy for children? You you said peanuts or wheat gluten you are wrong. Egg allergy is the second most frequent food allergy for children throughout the world, much of it is not recognised. The most frequent childhood allergy is to cow's milk. 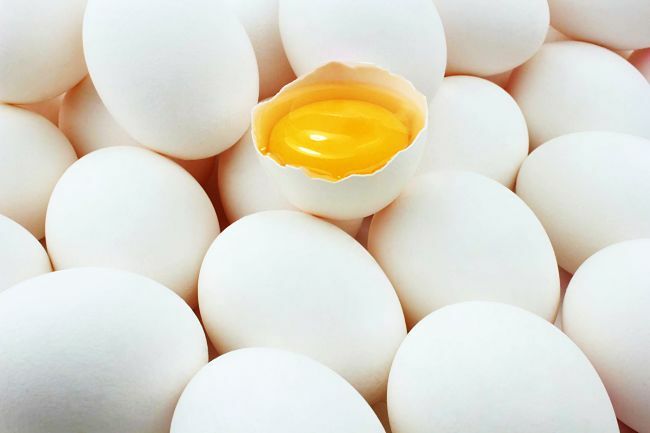 An associated issue is that many allergic reactions to vaccines are triggered by egg remnants in the vaccine, as eggs are used to manufacture many vaccines. Fortunately egg allergies are generally short-lived and disappear in most children by school age. In contrast peanut allergy and many other allergies can remain forever with only around 20 % of children growing out of a peanut allergy. So what is egg allergy? How can I recognise the symptoms? What can I do to avoid it? Can it be treated? Egg allergy is an immune reaction to proteins and other organic compounds from the whites or yolks of eggs. 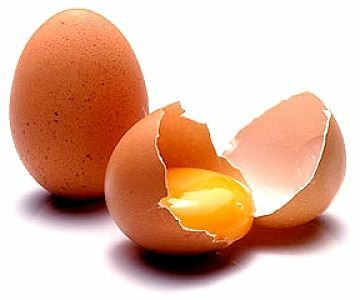 It is usually treated by carefully avoiding foods that may contain or be contaminated with traces of egg. Various people may be allergic to egg white or yolk of both and may easily tolerate the non-allergic part quite well. Rarely people who are allergic to eggs develop allergies to other chicken meat, turkey or poultry products. Until quite recently the general advice given to parents who suspected their child were at risk of developing allergies was total avoidance from a very early age. Parents were told not to give potentially allergenic foods to babies, especially during the first 6-12 month. That advice has been completely turned on its head and the latest advice is to introduce most childhood food allergy agents into their diets sooner rather than later - eggs, cow's milk, soy, wheat, fish, shellfish and with some caution peanuts and various types of tree nuts. With eggs, the advice from the National Health and Medical Research Council, Australia, in 2003, was to introduce yolk at 8 months of age and egg white at about 12 months, while watching for symptoms. But some studies have shown that introducing egg and other foods that cause allergy well before 9 months of age may actually help prevent allergies from developing. The concept is that starting the consumption of small amounts of such foods as early as possible may helps babies develop a tolerance, that does not occur with later introductions. The latest advice by the Society for Clinical Immunology and Allergy in Australia is to introduce solid foods from 4-6 months of age, that contain some of these risk food items. However this advice clashes with that issued by the World Health Organisation that babies should be breast fed for the first 6 months. The solution to this dilemma is to keep breastfeeding for at least six months and to introduce supplementary solid food after about 4 months if the baby is ready to try them. There is now greater emphasis placed on the importance on mothers getting enough vitamin E, vitamin D, zinc and other nutrients that are important for maintaining the immune system of mothers and helping develop the immune system in babies (link here. Recent research has highlighted the importance of vitamin D for preventing other allergies as well including asthma. There is a worldwide trend for vitamin D deficiencies in the general population and in pregnant women associated with lifestyle changes and people not getting enough sun exposure. There is a growing trend to add vitamin D supplements to many foodsto overcome this, but breast fed babies are particularly at risk. The more severe allergies may lead to severe reactions called 'anaphylaxis' which is potentially life threatening and requires a rapid emergency response and medical care. The time taken for the response can vary, but if any of these signs appear immediately seek emergency medical attention. Previous Occurrence in the Family history - The risk is higher if one or both of the parents, or siblings have food allergies, asthma, or various other type of allergies such as eczema, hay fever or hives. Dermatitis and skin rashes - Children that show signs of skin reaction are at greater risk of developing food allergies. 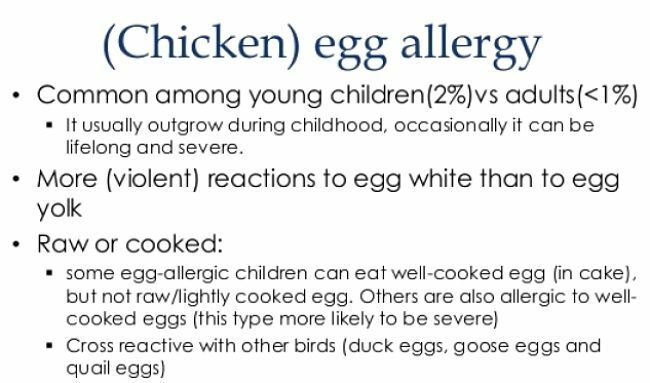 Young Age - The well known tendency for egg allergies to wane with age means that allergies are more likely in younger children. The flu vaccine and several other vaccines are manufactured using chicken eggs and embryos and because of this the vaccine will probably contain various egg proteins as contaminants. Different brands of flu vaccine may vary in their egg protein content. 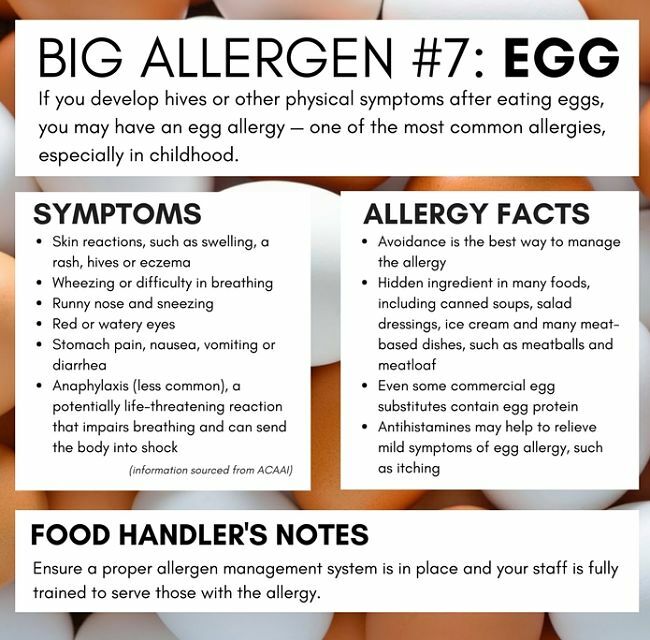 Parents need to be aware of this if their child is known to have egg allergies or has not been exposed to egg products in their food.